With three draws out of the way, there’s no clear leader of the pack yet at the 2019 Canadian Mixed Curling Championship. Seven teams remain undefeated at the championship and well in contention to play for gold later this week at the Fort Rouge Curling Club in Winnipeg. Quebec (Félix Asselin), Saskatchewan (Jason Ackerman) and Yukon (Bob Smallwood) all have 1-0 records in Pool A, while Nova Scotia (Kendal Thompson), New Brunswick (Chris Jeffrey) and Alberta (Kurt Balderston) sport similar records in the opposite pool. But it’s Ontario’s Wayne Tuck in Pool B that has a slight edge on the competition with one game in hand on the undefeated teams. 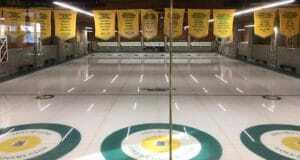 His team from the Ilderton Curling Club has a 2-0 record following the afternoon draw on Monday. Draw 3 was quiet with two of the four sheets in use, but it allowed Tuck to gain an advantage over the pack. He took a commanding lead against Mel Sittichinli of the Northwest Territories, en route to a 10-3 win in Ontario’s second game at the 2019 Canadian Mixed Curling Championship. Highlights included a score of three with hammer in the opening end and a steal of four in the fourth. Trevor Bonot, of Northern Ontario, had the opportunity to keep pace with Ontario but could not tame Manitoba’s Colin Kurz. A score of three in the fifth and a steal of one in the sixth elevated Manitoba to a 7-3 victory against Northern Ontario, which was a great bounce-back game (see Draw 1 for more information about Manitoba’s first game). Both teams now have 1-1 records. On Sheet A, Saskatchewan’s Ackerman battled through a game with Nunavut’s Ed MacDonald to earn his first win of the event. Ackerman, the 2012 mixed champion, opened the game with steals of two in the first and second ends. He held a 6-2 lead heading into the seventh, but a deuce by Nunavut gave the territory team a chance to set up an eighth-end steal attempt. It was nixed after a missed last shot, giving Saskatchewan a 6-4 win. Yukon’s Smallwood won the most offensively-charged game of the event so far. His team stole a point against Newfoundland and Labrador in an extra end to win 9-8. In the seventh end, Newfoundland and Labrador skip Harold Walters took an 8-7 lead with a score of three. Smallwood scored one in the eighth end to tie the game and picked up the steal of one in the extra end to win. Balderston, the 1992 mixed champion, and his team from Alberta played a fiercely competitive game against the young British Columbia team skipped by Cody Tanaka. Balderston did not score more than a single point in an end, but led his team from the Grande Prairie Curling Club to victory by scoring one in the eighth end to win 4-3. While Tanaka opened the game with a stolen deuce, he didn’t put another point on the board until the seventh end. Balderston, on the other hand, stole single points in the fifth and sixth ends to pad the score in his favour. New Brunswick’s Jeffrey is feeling comfortable after opening the event with a 6-4 win against skip Melissa Morrow (throwing third stones). While Prince Edward Island opened with a deuce, New Brunswick scored singles in the second and third ends to tie it back up. The teams traded single points in the fourth and fifth ends before the tide turned in New Brunswick’s favour. Prince Edward Island scored one in the sixth, but New Brunswick put up its first crooked number, a score of two, in the seventh and stole one more in the eighth to win the game. 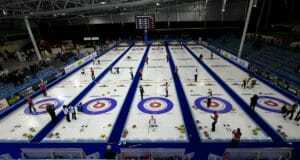 The 2019 Mixed Curling Championship began on Sunday with one draw following the opening ceremony. Quebec’s Asselin faced some misfortune against Manitoba’s Kurz in the eighth end, but his team bounced back. Asselin’s final shot, with hammer, could have won the game in regulation but it picked during his delivery. Instead of celebrating a victory it, it set up a Manitoba steal of one and a tie game at 4-4. 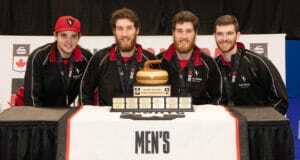 Quebec regrouped and scored one in the extra end to defeat the hometown team 5-4. Northern Ontario’s Bonot and Ontario’s Tuck each opened with 9-2 victories against Nunavut and Prince Edward Island respectively. Nova Scotia’s Thompson blanked the Northwest Territories 12-0. Action continues on Monday at 6 p.m. (all times CST), and Tuesday morning at 8 a.m.